Purana Qila also known as old fort was built by Humayun and Sher Shah. 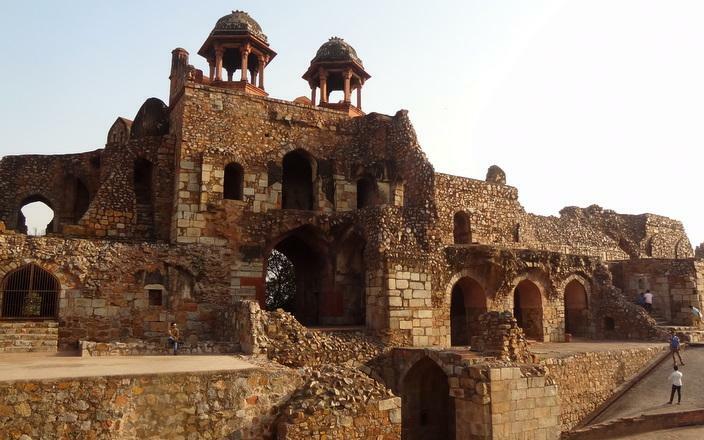 It is one of the oldest forts present in Delhi. It is constructed on the historical site of Indraprastha. Humayun began the construction in 1533 but it took five years to complete. Sher Shah of Sur dynasty who ended Humayun’s reign ruled and built many monuments in purana Qila. The fort was originally built on river Yamuna before it changed its course. Purana Qila consists of three gates Humayun Darwaza, Talaqi Darwaza and bara Darwaza. The walls of these are huge and are built in red sandstone. The Bara Darwaza which is facing west is the main gate. Talaqi Darwaza is also known as forbidden gate. The Humayun Darwaza was constructed by Humayun. The gates are beautifully decorated with marbles chhatris, jharokhas with Rajasthani architecture. 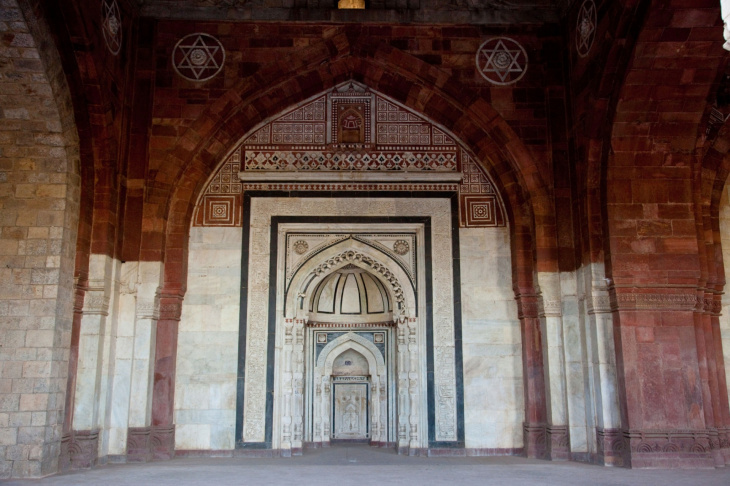 Among the surviving monuments in purana Qila are Sher Mandal and Qila-i-Kunha mosque. Sher Mandal is a double storeyed octagonal tower which was originally started by Babur for his son Humayun. It is constructed with red sand stone with steep stairs till the roof. The tower is supported by 8 pillars with chhatris all round. Humayun later used it as library. It is believed that Humayun fell from the second floor of this tower and died of injuries in the year 1556. Qila-i-Kunha mosque was built by Sher Shah of Sur dynasty. It has the pre Mughal architecture. It consists of a single dome with pointed arches and five doorways. The arches are in the shape of a horse shoe. The mosque has calligraphic inscriptions. Marbles of red and white are used for these inscriptions. 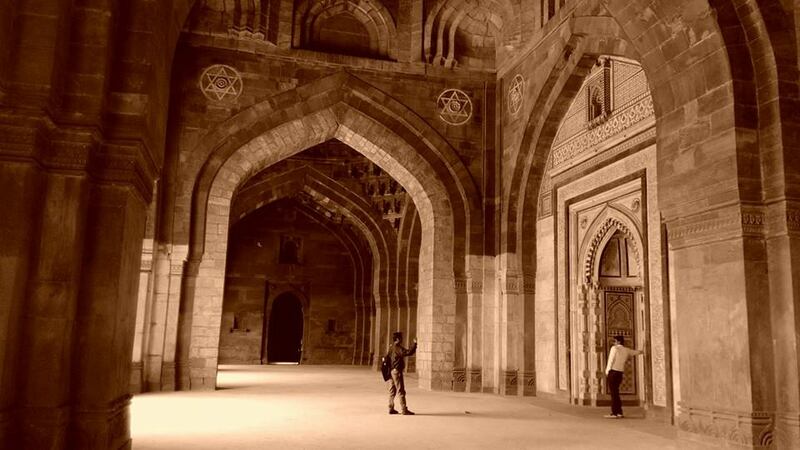 The prayer hall has five Mihrabs on the west side of the wall. The mosque has an inscription on marble which reads as follows: ‘As long as there are people on this earth, may this edifice be frequented and people be happy and cheerful in it’. There is also a small museum inside the fort which displays many artefacts. Another important monument is Baoli which is 22m depth was an important source of water. It is a beautiful place to visit. Nearest metro station: Pragathi maidan. Visiting hours: Sunrise to sunset.